Thailand’s Election Commission has rejected the pro-Thaksin Thai Raksa Chart party’s nomination of Princess Ubolratana as its sole candidate for the post-election prime minister. 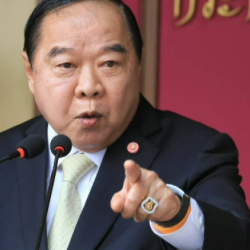 The commission also considered the demand for the Thai Raksa Chart party’s dissolution for allegedly involving a member of the Royal Family in politics, but the discussions remain inconclusive and will be continued tomorrow. According to a press release which was issued this afternoon after a meeting of the EC, the commission has endorsed 69 prime ministerial candidates proposed by 45 parties, including current Prime Minister Prayut Chan-ocha. Citing the Royal Command issued on Friday night, the press release said that, since Princess Ubolratana is a member of the Royal Family which is traditionally and constitutionally above politics, her nomination as a prime ministerial candidate by the Thai Raksa Chart Party is deemed to contravene the spirit of the Constitution and to be against the tradition of democratic rule with the King as the head of state. The demand for the dissolution of the Thai Raksa Chart party was brought to the attention of the EC by political activist Srisuwan Janya who accused the party of violating Rule 17 of the EC’s campaign regulations which forbids any candidate or party from involving the Royal Family in electioneering. Srisuwan demands that the EC send the case to the Constitutional Court to rule on the party’s fate which, if found guilty, would result in the dissolution of the party and political banishment from politics of its executive members. The EC’s press release disclosed the names of all the 69 prime ministerial candidates. The list includes Khunying Sudarat Keyuraphan, Chadchart Sitthipan and Chaikasem Nitisiri of Pheu Thai party, Abhisit Vejjajiva of Democrat party, Thanathorn Jungroongruangkit of Future Forward party, Anuthin Charnveerakul of Bhumjai Thai party, Pol Gen Seripisut Taemeeyavej of Seri Ruam Thai party, Mingkwan Saengsuwan of Setthakit Mai (New Economics) party, Ms Kanchana Silpa-archa of Chart Thai Pattana party, Suwat Lippatapallop, Wannarat Charnnukul and Tewan Lippatapallop of Chart Pattana party. Lesser known candidates from smaller parties include Pongsa Chunam of the Green party, Chumphol Krutkaew of Klang party, Tassachon Pongpakawat of the Kasikorn Thai party, Thira Jiaboonyok of the Khon Ngan Thai party, Thanaporn Sriyakoon of the Khon Thammada party, Preeda Boonploeng of Thai Teachers for the People party, Sayant Inthrapitak of Klong Thai party and Chingchai Mongkoltham of New Aspiration party.